Blood oath: Standing a few inches taller during a photo shoot at the new Warrandyte Reserve club rooms last week with Campbell Brown and Glenn Archer were Warrandyte Junior Football Club players (from left) Josh Huntly, Finn Swedosh, Oscar Poole, Niels Withoff, Jarrah Sofarnos and Jack Poole. 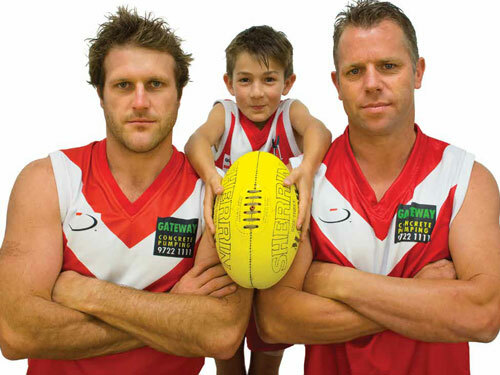 WARRANDYTE Reserve will come alive to a carnival-like atmosphere on Saturday, June 21, when two former AFL champions will grace the turf wearing the red and white, in celebration of the new pavilion opening recently. Campbell Brown, who retired in controversial circumstances before the 2014 season started, played 205 AFL games with Hawthorn and Gold Coast from 2002 to 2013. An All Australian representative in 2007, Brown was known for his aggression and attack on the football. He recently purchased a house in Hurstbridge. Also playing for the Bloods on the day is “Shinboner of the Century” Glenn Archer. 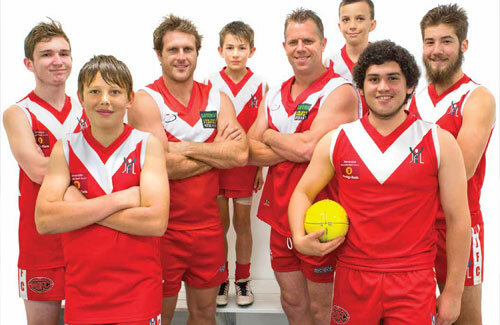 No stranger to the club, Archer who last played for Warrandyte in 2009, is an assistant coach in 2014. Warrandyte will be playing Silvan in the Division 4 battle at 2pm on June 21. Admission is only $7.50 and Under 16s are free. An Auskick grid match will take place at halftime of the senior game. Bloods president Stephen Bell believes it is a massive coup for the club securing Brown for the game. He says the club is also excited about the opening of the new pavilion introducing a new era for Warrandyte sporting clubs, not just the footy clubs. “It’s finally arrived, we’ve been waiting for this new pavilion for a long time and there’s a real buzz around the whole Warrandyte community,” Bell told the Diary. Bell says anyone who thinks the former Hawks and Suns star is past it should think again. “He had completed a full pre season with the Gold Coast Suns before the ‘incident’ occurred so this is no over-the-hill ex AFL player – he is fully fit still,” Bell said. “And of course, Arch – he has been sensational for the Bloods so far, helping out at training and on match day. “If you are going to come to one game this season then this is the day to come.